Department Chair: David Gargone, Ed.D. The major requires all students to take 12 business core courses, a selection of 15 additional credits in a business sequence, and 18 credits in free electives. 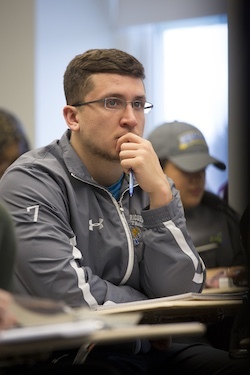 Majors must complete the 48-credit college core as required of all Misericordia University students. The Business Administration Major permits students to freely fashion their study to meet their professional and personal needs. The curriculum contains sufficient flexibility to meet most needs and expectations of the students, both those who intend to go on to graduate school and those who see immediate entrance into the profession. Students in the major need to work very closely with their advisor in the selection of courses. The major permits students to take an aggressively quantitative or qualitative track or an equal balance between the "management by numbers" position and the "management through people" concept. Students are given instruction in business writing and presentation skills. In May 2011, 42 undergraduate business students and 13 graduate business students were inducted into the international business honorary society Sigma Beta Delta. Throughout the course of 2010-2011, approximately 75 percent of business students participated in or assumed leadership roles in advanced business internships, sales training, entrepreneurship, service learning, on-campus professional event management and numerous other professional opportunities. The Business Department continues to develop a comprehensive assessment of its business core curriculum. 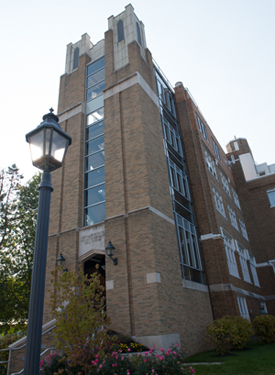 These reviews and recommendations for changes will be brought up for approval in 2012 and will be reflected in the revised university catalog of 2013. Assessment standards also are being revised and implemented accordingly. All business major curricula will be reassessed in light of changed expectations of the business core. These efforts are expected to last through late 2012 and will be reflected in the university catalog for 2013.
Business Administration majors must achieve a GPA of 2.15 in the major by the beginning of the junior year and a GPA of 2.25 in the major by the beginning of the senior year. Failure to maintain the appropriate GPA will result in suspension from the major until the GPA meets minimum standards. This policy covers all Accounting, Business, Management Information System and required courses in the major. In addition, students must have a cumulative grade point average of 2.0 for the 48-credit core in order to graduate. Select Specialization Minor: The Select Specialization is available only to transfer students with a minimum of 15 completed credit hours (grade of "C" or better) in a business-related field not offered at MU. Students with credits in a business-related field not offered at MU may apply those credits as a sequence in the Business Administration major. General Business Specialization: Five business non-core 300 and 400 level BUS, ACC and MIS courses (minimum 15 credits) for which the prerequisites have been met. Uses of accounting data in planning and controlling business activities. Manufacturing cost systems, budgeting, standard costs, and responsibility accounting are some of the topics discussed. Analysis of financial statements are emphasized. Microcomputer electronic spreadsheet applications are utilized. Accounting majors should not take this course. This course is oriented to the managerial and the strategic aspects of sales management. Emphasis will be placed upon recruitment of the sales force, compensation policies, effective territorial alignments, time management, and financial responsibilities. Interpersonal selling techniques are explored and discussed. A comprehensive study of the theory and practical applications of advertising and sales promotions as forms of communication in marketing. The student gains an understanding of strategic planning, objective setting, tactical decision making, research, message and vehicle selection and execution. A study of the principles of money, interest, inflationary and deflationary pressures, and the development of the banking system with emphasis on the federal reserve system, and monetary and fiscal policy. This practical course provides a comprehensive, managerially focused guide to formulating pricing strategy. It is a guide to profitable decision making and provides a basis for analyzing pricing alternatives. Strategic marketing examines the concepts and processes for gaining a competitive advantage in the marketplace. This capstone course presents a series of problem cases of actual firms, and focuses on helping students gain an appreciation for decision making in real-world situations. This course looks at emerging paradigms and administrative issues that face today’s managers. Students are exposed to a variety of topics. Focuses on management practices unique to small businesses, preparation of the student for small business ownership, identifying characteristics of small businesses, and describing the rewards and problems involved in managing retail stores, service firms, and manufacturing firms. An opportunity for students to explore nontraditional marketing phenomena. Great societal marketing opportunities exist in organizations other than business firms. Special areas of marketing that need attention include nonprofit, health care, education, ideas, places, political candidates, service, and international marketing. Topics vary from semester to semester and are announced with preregistration information. On-the-job training in the business community. Students must have senior status, a GPA of 2.5 or above, and college dean approval to participate. The course examines the discipline of sport management. Areas to be covered include: careers in the industry, growth trends in the industry, and an overview of the management of a variety of sport organizations including professional and intercollegiate athletics. This course provides students with an understanding of the relationship between sport and the society we live in. Theoretical framework, assumptions, and principles associated with this phenomenon will be examined. Students will be encouraged to think critically about sport and the place it holds in social life. Using this body of knowledge, the student will complete a research paper on a topic such as deviance in sport, youth sports, sport and race, etc. Sport and Athletic Administration will provide the student an understanding of the various components and activities involved in an athletic or sport program administration. The inter-relationship within the institution, tasks to be performed, policies, and procedures will be examined. Attention will also be given to the role of the organization’s sport or athletic leader. This course investigates the fundamental principles in sport event and facility management. Various managerial practices will be analyzed. Topics to be discussed include, but are not limited to, risk management, event planning, housekeeping and maintenance, and current trends in the industry. This course focuses on the application of marketing principles and practices relevant to the sport industry. Theoretical and practical applications of marketing professional and amateur sports are examined.